I might be the only person to have seen both Dead Man’s Burden and The Ballad of Lefty Brown, two Westerns directed by Jared Moshe, his only two feature films, as a matter of fact. DMB (not to be confused with Dave Matthews Band) was a film that walked a fine between farce & ridicule and actually paying homage to the genre. 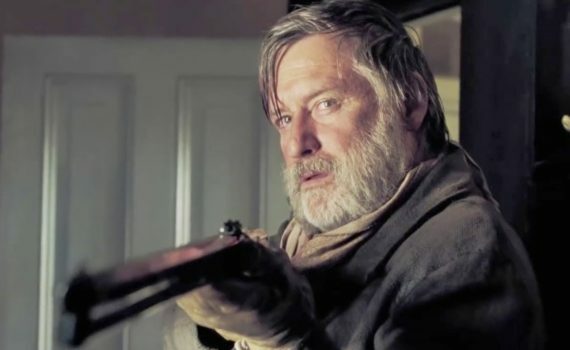 Perhaps it helped that the actors were no-names, that expectations were low, that I wanted to enjoy a good cowboy flick, but I rather liked Moshe’s first attempt. I thought it was corny in just the right ways, using the language of the time so thickly that it almost seemed like they were poking fun, but somehow making it work, if barely. I could see, however, that if you watched from a slightly different angle, you could absolutely hate the film, and I think my head was cocked for TBOLB, because I’m not sure I’ve ever despised a Western more. Lefty Brown has run with Edward Johnson for the past 40 years, the pair as close as friends can be. They fought in wars together, protected the law together, built a ranch together, but now Edward is off to Washington to be a Montana Senator, while Lefty, never the brains of the operation, will stay behind to man the farm. But before plans can commence, Edward is killed by a sharp-shooting horse thief, and Lefty is off to catch the criminal as a one-man posse. His two friends, Jim & Tom, part of the old foursome that saw so much action together, want him to wait for the army, let them deal with the murderer, but Lefty is insistent. What he discovers on the trail goes far above his head, but he knows one thing for certain; friends never betray friends, and if they ever do, their punishment should be swift. The Ballad of Lefty Brown is no Bone Tomahawk or Dead Man’s Burden, two films it tries to meld; hell it’s not even The Ridiculous Six. In all seriousness, Adam Sandler made a better Western than Bill Pullman, and I’m not really sure we should be all that surprised. Pullman is an awful actor, and oh dear lord did they make it even harder for him by giving him the most terrible supporting cast you’ll ever see. Kathy Baker and Peter Fonda were bad, but Jim Caviezel and Tommy Flanagan were SO bad that they made Pullman look like a golden god. I like Joe Anderson, I think he stood his ground, but there was absolutely nothing he could do. The “dialogue”, the “plot twists”, the “action”; it was so horrible I felt personally insulted. I know that the fine line always exists, because this is a genre that can be cheesy and weird. But I’ll defend Westerns to my grave; this film took a dump on the line, stepped over it, and began masquerading as a movie until I wasn’t sure what the hell was what anymore. If I’ve seen a worse example of this genre it was either Living by the Gun or Doc Holliday’s Revenge, or both, but I have a special beef with TBOLB now. It should have known better, it should have BEEN better, and I’m angry that something this ludicrous was ever made.